Access the world's largest database of benchmarks and best practices. Compare your performance using robust online tools. Best-practice organizations are becoming more sophisticated in their use of career development tools. These advances in career development aim to ensure that employees remain engaged, aware of their opportunities for advancement, and equipped with the resources they need to grow their skills and competencies. 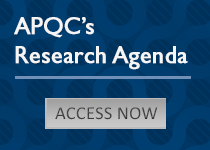 In December of 2018, APQC conducted a survey to understand the common challenges and priorities of process and performance management practitioners as they move into 2019. This summary report looks at the top five priorities and challenges and also explores trends in digital transformation professions in the new business environment. This report describes the goals that KM programs are prioritizing this year, the tools and approaches they’re investing in, and the trends and developments they expect to have the most impact on their organizations. The analysis is based on results from APQC’s 2019 KM Priorities Survey.